50-ft mural festooned with cookie imagery painted on the wall of Moolchand underpass but authorities have no idea how it came up. 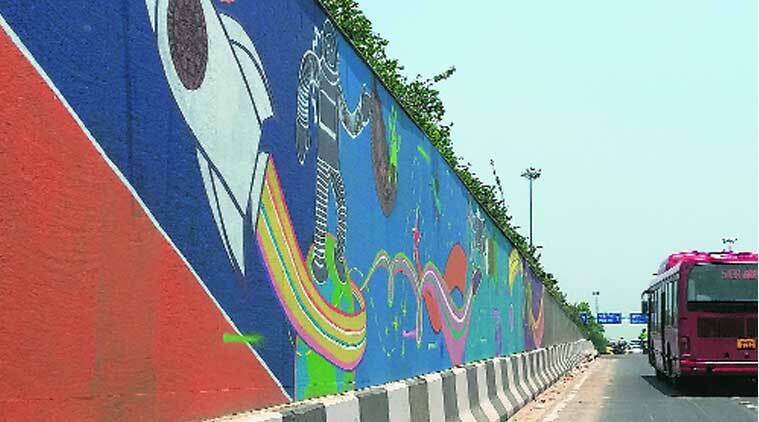 Those of you using the Ring Road underpass that goes from South Extension towards Lajpat Nagar in the past few days may have noticed a lively, colourful mural spread along the length of the wall. The roughly 50-ft wide mural depicting a fantasy scene from space shows a spacecraft, an astronaut, a green alien and, of course, brightly coloured stars. But what can be mistaken for a beautiful work of street art is actually a clever advertising and branding exercise for Oreo cookies. It seems to have come up without the knowledge of the civic administration — in this case, the Public Works Department (PWD). The mural is part of Cadbury Oreo’s “Play with OREO” campaign, an exercise by the company to reinvent their product and encourage a sense of playfulness among its customers. Besides the new TV commercial for their campaign, Oreo is using graffiti, wall art and other outdoor advertising tools. “Murals are a way of encouraging people’s imagination. They allow people to express themselves freely. We met a few wall artists and asked them to express their thoughts without thinking much about the brand. If the artist can integrate the brand into the idea then it is great,” said Chellan Pandyan, senior director biscuits, Mondelez India, which is running the Oreo campaign across Bangalore, Delhi and Mumbai. While these murals across the cities are not meant to be overt hoardings for the Oreo brand, they carry a clear depiction of the cookie brand, at least going by what is seen at the Moolchand underpass. The mural there has Oreo cookies all over the canvas and a signature scribbled at the bottom with the Oreo cookie name. “The mural is not meant to be a hoarding for the brand. For instance, you will not find any branding in the Bangalore mural. We just told the artists to use the shape of the cookie or the colour of the cookie in their works,” Pandyan said. This kind of commercial advertising is not permitted on public infrastructure without civic permission. While the makers of Oreo maintain that the agency responsible for executing this mural, Candid Marketing, took necessary permissions, PWD said such permission was never sought by any party. “We work with Candid Marketing for our branding efforts. We choose places based on popularity and places for which the authorities give permission,” Pandyan said. Efforts to reach Candid Marketing proved futile.